It's possible you may have spent a lot of time trying to figure out the right staff management approach for your business. Perhaps the staff management software you’ve been using doesn’t allow you to have effective schedule management or easily accessible shift management features. The inconveniences caused by insufficient employee scheduling methods could become a thing of the past with Zip Schedules, a software program featuring a digital employee scheduling template and mobile app, which allows you to manage your employee schedules with ease. You’ll save time and money, which means your staff management needs are met all without any bulky software. The Zip Schedules digital scheduling template and mobile scheduling app are easy to use, and bear similarities to the layouts of excel work schedule templates and Microsoft employee schedule templates, so you don’t have to worry about learning something completely new. Zip Schedules is the most effortless, most affordable and most complete staff scheduling solution available. The Zip Schedules scheduling software brings together employees, management, and company scheduling together, so communication is easy between the whole team. As all employee scheduling data in the Zip Schedules software, is held in the cloud, you won’t need to worry about there being anything to do other than download our app. A cloud-based system is a reliable system, so with a digital scheduling template, as opposed to an excel work schedule or a Microsoft employee schedule template, you won’t have to worry about your staff schedules getting lost. Cloud-based storage and accessibility are huge advantages for employee scheduling software to possess, especially when comparing this scheduling method to an excel work schedule template or Microsoft employee schedule template. When considering that the cloud-based feature allows for employee schedules to be accessed from anywhere with internet access at any time, other manual methods of employee scheduling like an excel work schedule template or Microsoft employee schedule template pale in comparison. Many employee scheduling software systems lock users into a contract, so then they're stuck with them even if it’s not the right solution for their business or employees. 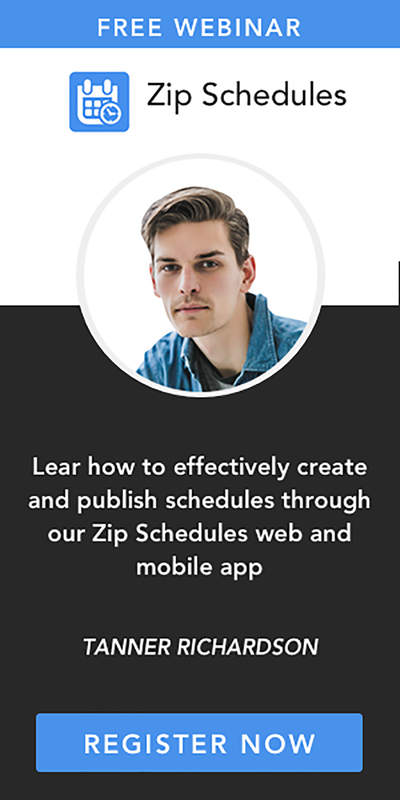 Here at Hubworks, we offer a 14-day free trial which means you can see if our Zip Schedules digital scheduling template and mobile scheduling app are the right solution for your business and staff management needs. 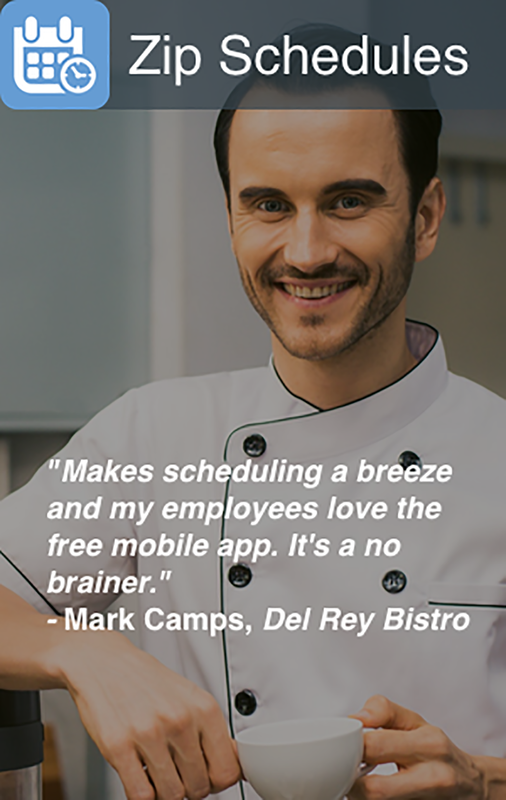 With Zip Schedules employee scheduling software, businesses eliminate any scheduling mistakes as both managers and staff can synchronize through our free mobile app. With Zip Schedules digital scheduling template, there is no more messing around with excel work schedule templates, Microsoft employee schedule templates, sticky notes and odd messages here and there. Digital scheduling templates and mobile scheduling apps, like Zip Schedules, allow for real-time staff management from anywhere with an internet connection! Many employee scheduling tools whether excel, cloud, or web-based are far more complex than they need to be. Getting started can be a painstaking process that requires the extra help of consultants and adjusting to a new system can be extremely overwhelming and costly. Here at Hubworks, we overcome these concerns with Zip Schedules by providing a self-implemented system that is easy to learn using conveniences like streamlined onboarding, intuitive interface, and free mobile apps. Once your business has a digital scheduling template and mobile scheduling app up, running, and implemented, all you need to do is import an employee list to make sure that you can manage shifts, staff, and schedules all in one place. With Zip Schedules employee scheduling software, staff management has never been easier. Zip Schedules makes it so that management no longer has to worry about how to make a schedule since the employee scheduling software allows for management to save their favorite schedules as a scheduling template, so a new schedule suitable to their needs can be quickly created. A weekly schedule template can be updated by dropping the new shifts into employee slots, as opposed to having to create a new schedule each time as seen with old, manual scheduling methods such as an excel work schedule template or Microsoft employee schedule template. By doing this, you can save any schedule as a template, so that shift management is completed in minutes. You no longer have to spend ages worrying about or sorting out shift management. At some point, every business will gain or lose employees. Zip Schedules enables you to add or delete employees right on the schedule without fuss. Not only that but using a program like Zip Schedules means that managers can offer any available shifts to those qualified. Staff management doesn’t have to be an arduous task, which is why Zip Schedules enables you to do so many things all on one platform to keep you and your employees in the loop. Zip Schedules empowers employees by giving them the ability to shape their schedule. All employees have to do is download the free Zip Schedules mobile scheduling app, and they can then view their schedules and make requests anywhere. Owners and managers have lots of things to remember, and sometimes it’s hard to keep track of everything, let alone an employee's request for time off. By using the app, employees can make requests, such as time off, availability changes, and shift trades, that can be instantly managed. This increased functionality will increase your staff management capabilities, so you know who is available when, and where there are shifts that need to be filled. Zip Schedules scheduling software will also tell you if you’re going to violate any labor laws, unlike an excel work schedule template or Microsoft employee schedule template. The Zip Schedules mobile scheduling app and digital scheduling template software will provide you with preemptive labor law alerts so managers can avoid any hefty violations. Here at Hubworks, we want to keep you and your employees safe, which is why our staff management system is extremely cost effective. Not only do we have reasonable subscriptions, but we also want to help you avoid law breaches so that your business runs smoothly and without overtime faults. Schedule management is something that many people dread. Sending out all those emails and trying to make sure that nobody is missing is often a long, repetitive and difficult task. Zip Schedules makes employee and scheduling management easy. Using the Zip Schedules digital scheduling template, you can create a schedule and send it out to all employees easily with one click of a button. By simply clicking ‘Publish,' all of your employees will receive the schedule through their email or mobile app. Even if you need a reminder to create your schedule, we have other tools like Zip Checklist that can help you with your organization even further. If you’re concerned about going over your labor budget, don’t be! Our Zip Schedules mobile scheduling app comes with labor budgeting tools so that you don’t overschedule. Staff management is difficult, especially if you can’t see how much you have to spend right in front of you. However, this needn’t be an issue as Zip Schedules helps managers to set daily and weekly budget goals so that they can gain control over labor costs to enhance schedule management tasks. 1. Our Customer Success Team responds within 15 minutes, so your questions are answered quickly and efficiently. You won’t wait long to resolve any issues. 2. We offer multi-language capability, which means that you’re not limited to English. We support Spanish, French, German, Italian, and Chinese. 3. Our guided walk through during sign up and in-app video tutorials mean that you have plenty of advice to get you started. All of these things and more mean that we have an advantage over our competitors and we aim to provide you with top quality services and advice. Our system is flexible, reliable and innovative to make your business needs seamless. Staff management has never been easier, and schedule and shift management is a breeze with Zip Schedules. So, what are you waiting for? Get your business scheduling into shape so that you can have effective staff management. If you still need more coaxing as to why digital scheduling template software trumps outdated, manual methods of employee scheduling, such as an excel work schedule template or Microsoft employee schedule template, check out our "Work Schedule Apps | A Complete Guide" article, which is also on the Hubworks Blog.